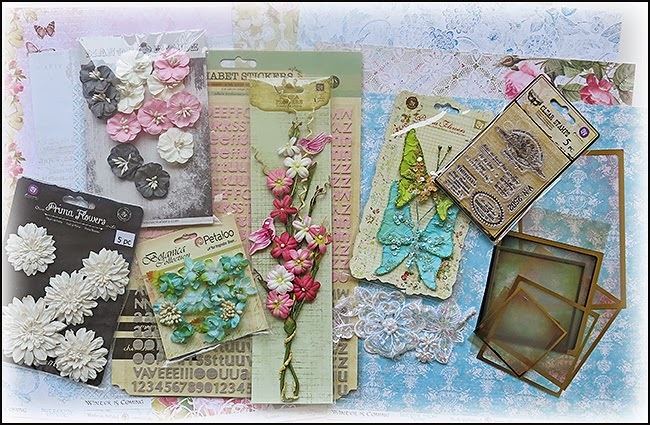 Our March Kit "Between Winter and Spring" is beautiful, and we would like to share the Bits and Pieces from Leslie's kit with one of our blog readers. In this collection you will find paper from kit, flowers from the kit and flower add-on, and items from the embellishment add-on. There is enough in this giveaway to create several projects. The winner of this challenge must be a follower of our blog. 2. Use the Inlinkz tool at the bottom of this post. The giveaway will close at midnight, March 12th. The winner, selected by a random draw, will be announced the following day. Beautiful giveaway.Thanks for the chance. Thank you for giving me a chance to dream! I enter every month hoping that THIS will be my month to score these lovely products and I love seeing all the beautiful creations by the designers! Thanks for the chance to win these yummy goodies! Beautiful collection of bits and pieces. Thanks so much for the chance to enter. I just want to know what's exactly the product in the middle of the picture (the flowers with birds and swirl), and which company it is. Thank you so much. It is a Prima Vine, Dragongirl. Thanks. Sikken en dejlig giveaway, jeg vil meget gerne være med her, jeg har selv en candy på min blog på grund af "tre års candy fødselsdag" jeg håber da, du også vil være med hos mig, følger har jeg været meget længe, du er lagt i min sidebar og her er en lille kommentar. knus morkaren. All of that good stuff would really add to the March kit. Thanks for the chance to win. WOW that is so beautiful, thanks!!! Leslie, I truly enjoy sharing this RAK with my readers and find this campaign to be brilliant for advertising your KITS as well as sharing the love of quality products that a crafter would be thrilled to receive the latest and the greatest... well done!!! Such pretty bits and bobs... thanks so much for another chance to win! Всегда великолепные призы !!! Благодарю за шанс !!! Thank you for the chance to win. Great giveaway! Layouts with April Kit By Ulrika! March Madness - 20% Off Storewide!